Even if smartwatches all do more or less the same thing, manufacturers have very different approaches. From fitness to your daily agenda, smartwatches can perform many functions, usually all at the same time. Mobvoi sees the smartwatch as a tool that can replace the smartphone, and even as a weaning method to reduce smartphone use. Mobvoi Ticwatch S and E: what more could you want from a smartwatch? Smartphone addiction is a well-known problem. We can ask ourselves the question of liability: is it the user’s fault that they easily get caught up in a spiral of apps (and particularly social networks)? Or is it developers’ fault who do everything to retain as many people as possible because their financing system depends on it? That’s a long debate that we won’t get into here, but it’s interesting to see that manufacturers and even developers are looking at the problem (Facebook, Google and Apple are on the front line). Mobvoi wants to help users to use their smartphones less. Its solution, which might seem strange or paradoxical at first, concerns the use of another device: a connect smartwatch. The Mobvoi manager we met explained to us that there are many situations in which it is more interesting to use your smartwatch than your smartphone because of its speed and convenience. Google also indicated this by explaining that users’ interaction time with a smartwatch is on average 5 seconds (in theory). This means that users remain much more immersed in the real world (in theory) with smartwatch use in comparison to smartphone use. Some people are probably already saying to themselves (and rightly so), “Okay, here's another device I have to charge”. There’s also the cost of the watch, which although is much lower than the new Apple Watch, it’s still quite high. Moreover, since everyone uses their smartphone differently, it’s almost impossible to provide a universal solution. Every user has to ask themselves what they really need. What do you do with your smartphone? Most people just send and receive instant messages or emails, spend time on social networks and use a few apps to access content (whether it be text, audio or video), along with various business uses. You might also be a fitness enthusiast and use specialized apps for that. So the question arises: can the TicWatch help you? I would describe myself as this kind of user, and I tested the watch for a few weeks and can give you my early impressions. But be careful, these are just a reflection of my point of view. I have to admit that because I was receiving notifications on the watch, I got used to not taking my smartphone out all the time. I was able to read the messages in a few seconds and if I needed to I was able to send a reply (it’s hardly practical to type a message, so it might be better to just read them). Of course, if you’re quite chatty, you’ll want to pull out your smartphone and answer every time, but reading my messages on the watch motivated me to answer only when necessary. 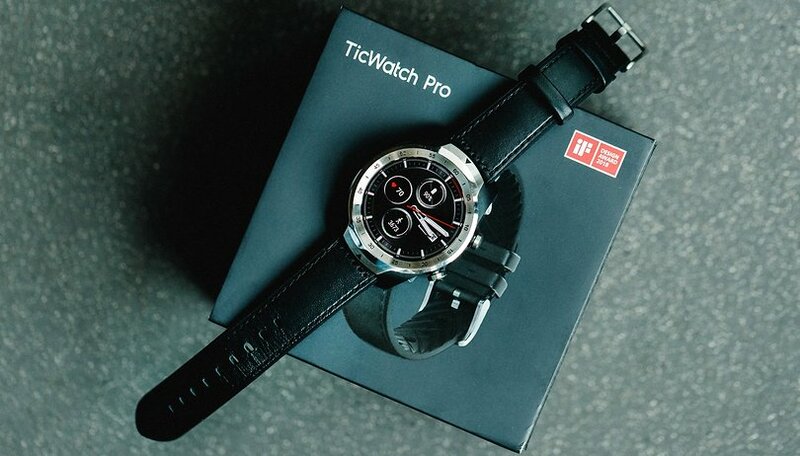 The great strength of the TicWatch Pro is undoubtedly its autonomy. After deactivating NFC and GPS (which were useless to me) and Wi-Fi (since in any case I receive the information from the watch) I obtained several days of battery life. Several days of notifications, step calculation, music control... it is also possible to use Google Assistant, but as far as I am concerned it is of no interest. The watch has its store and can use some app, such as Google Translation, but if you have to spend a good amount of time on an app, you might as well pick up the phone. If you use your smartphone as your main multimedia tool and use it to play games and watch a lot of videos, it’s clear that a watch won’t be able to replace your smartphone in these areas of use. If you’re always taking advantage of your smartphone’s large screen, it doesn’t make sense to replace it with a much smaller screen. Similarly, if you take a lot of pictures, watch videos, game and send a lot of messages throughout the day, you’ll have to do a lot of that with your smartphone since using the watch for these tasks is either impossible or very impractical. In the end, the Mabvoi watch holds its own own as long as you’re not totally addicted to your smartphone and aren’t asking your smartwatch to replace your phone. This will likely dissuade many people. The watch does have the advantage of addressing all types of smartwatch users, especially sporty users, but again there is the risk that the price will drive many people away. Are you interested in this watch? Let us know what you think of it in the comments! I was looking for an article like that. The ticwatch pro looks great, but some reviews said it's not as fluid as the watches using Qualcomm's processor. The ticwatch is quite affordable, but there's no way to buy it except online. U can't try it.